He won over the Swedish public with his stirring drum ‘n bass number “Hold On”, winning the televote and finishing second overall. 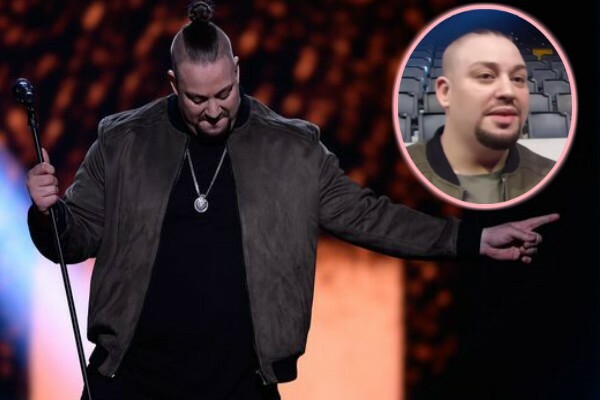 And while Nano narrowly missed out on the chance to sing at Eurovision 2017, he was feeling upbeat and positive when he spoke with wiwiblogger Tobias just moments after the show on Saturday evening. Eurovision fans inside and outside of Sweden have suggested that the international juries have too much power and they’re angry that the public’s pick won’t actually represent them in Kyiv. Nano is more upbeat about it all. Will he return to Melfest? In previous interviews with wiwibloggs, Nano has credited his children with helping him turn his life around. And he made it clear to us again that they remain the centre of his life — even on a night like this. What I know is that artists said the jury must not exist because Sweden must make the decision, but Christer Bjorkman insists that jury is good, he will never give up on jury. Why is he so stubborn, maybe because of ambition, he really wants to know how Europe thinks, because he only wants victory, and I’m sure that all Sweden wants victory, but this blind ambition, is it the right way ? Once more, if MF scrapped the international jury, other countries would probably be encouraged to do the same. Kerli would have had no chance at all at Eesti Laul without the jury. And let’s not forget Manel in Spain, where the real scandal was, where they sided with the JURY (of course, unforgivable) to break the tie. @Austrian Ari,Betty: There’s a story at ESCXtra.com about the public displeasure with the international jury. Quite frankly, at the moment I’d keep the jury if I were them, because more or less, they’ve made the right call. You could say the real dispute this decade happened in 2013, when they chose Robin Stjernberg and buried Yohio. He’ll be back. His presence out there reminded me of Linus Svenning’s participation in MF, after losing a brother. With the right material, he could very well remain a very strong contender the next time he sings at MF. I’m curious, what did Ace and Anton say? @milla: most esc fan’s memory span a few years. just don’t submit anything resembling the past few years’ entries and your entry will be called original i think. His life story is rather touching, and the song he participated with is quite good as well, but let’s be real people, Nano is still not a very good singer. If he intends to pursue further his musical career, I suggest he either takes some lessons or just do rap or something like that. I really believe “Hold On” should have won Melodifestivalen, but not with that vocal performance. He seems like such a nice guy! Original original original.. What the hell is original these days?? All this talk about originality hurts my ears! Italy is not original for example. Sounds like Coldplay or something! And what’s up wih the obsession with originality this year? It’s worse than ever. Esc-fans are hard to please. More than the average voter lol. What about an article about the scandal that is now in Sweden because international jury? Ace and Anton were not shy to speak their mind. It had to be down between Nano and Robin to go to Eurovision. Wiktoria is just not ready yet, she was making several key changes in her vocals during her performance and it ended up affecting her performance that’s why the juries didn’t give her higher points. @fikri: He was HELD ON some charges!! does anyone know what he was convicted for? Next week? 🙁 Shoot, I was anticipating and waiting for the revamp so much today. 🙁 I don’t know… but the “Wiwi calendar”, as I like to call it, said it was going to be revealed today, so I’m not sure if the date is incorrect or not. He truly was fabulous at Songvakeppnin yesterday 😀 . I also felt moved by his performances, one of the main reasons I follow him on every social media platform XD. @Unofficial: I thought Albania was next weekend, with Armenia? By the way, if you’re really a Mans Zemerlow fan – he was AMAZING at the Icelandic National Final! He sung a ballad and genuinely moved me!! Nano would have been a better entry at Eurovision. I didn’t like his song but he seems so down to Earth and humble. I’d love to see him return with a more unique song within the next few years, I genuinely think he could conquer Eurovision if he returns with the complete package. A #melfest to be forgotten. Just this…..